Via the specialized sister company Rent-A-Port Energy, Rent-A-Port is developing along with partners 3 offshore wind farms in front of the Belgian coast. Rent-A-Port is an investor and offers engineering services for the projects. 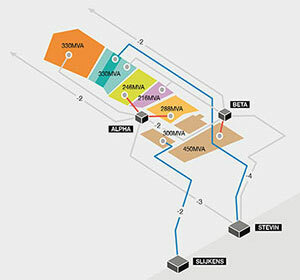 Besides the development of the wind farms, Rent-A-Port is involved in the coordination and investment in the central grid connection (Alpha) and looking at several storage projects of energy. Masterplan of the 7 offshore wind farms to be installed off the Belgian coast, with a total capacity of 2500 MegaWatt.